In this painting of the famous French painter Gerard Garouste “Three Masters and the fat gooses”, one can see Mister Shoshani sitting in the middle, between Kafka and Borges. 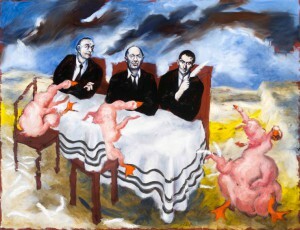 “Les trois maîtres et les oies grasses”, tableau du célèbre peintre contemporain Gérard Garouste. On peut y voir Monsieur Chouchani assis au milieu entre Kafka et Borges. This entry was posted in Uncategorized and tagged Borges, Chouchani, enigmatic, Garouste, genius, Jewish, judaism, kaballah, Kafka, master, Michael Grynszpan, monsieur Chouchani, painting, shoshani, talmud, גאון, מר שושני on June 1, 2018 by Monsieur Chouchani.